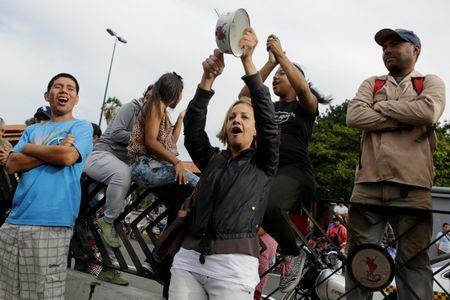 CARACAS (Reuters) - A man was shot dead on Tuesday during looting and food riots proliferating round crisis-hit Venezuela, an opposition legislator said, bringing to at least four the number of fatalities from this month's wave of unrest. Milagros Paz said that as well as the fatality, another 27 people had been injured during a day of chaos and violence in the eastern Caribbean coastal town of Cumana that she represents for the Justice First party. "It was all very confusing. There were simultaneous lootings in different parts of Cumana. They looted more than 100 establishments," she told Reuters from the National Assembly in Caracas, basing her information on contacts with constituents. 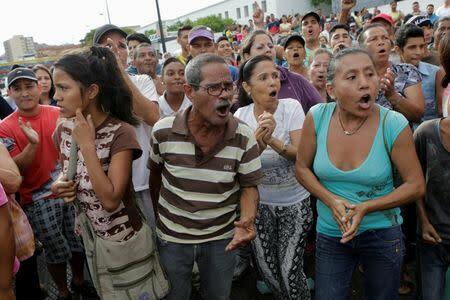 There was no confirmation from President Nicolas Maduro's government, though videos and photos on social media purporting to be from Cumana showed National Guard troops confronting crowds swarming round damaged shops. With crowds baying "We want food!" 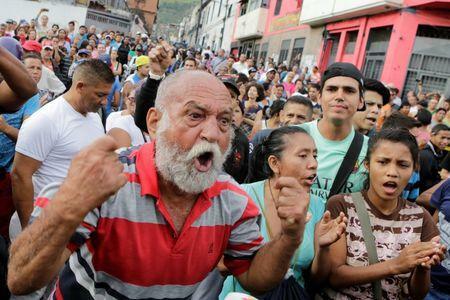 and security forces struggling to keep order, protests and melees at shops have been spreading around the recession-hit South American oil-producing nation in recent weeks, fueled by shortages of basic foods. Three other people were shot dead in the past week. A policeman and a soldier have been arrested. According to a local monitoring group, the Venezuelan Observatory of Violence, more than 10 incidents of looting are occurring daily across the nation of 30 million people. Venezuela's political opposition says Maduro and his predecessor Hugo Chavez are to blame for failed socialist economic policies. They are seeking a recall referendum this year to try to remove him from office. But Maduro, 53, says his foes are waging an "economic war" against him and seeking a coup. Government officials say there is not time this year to organize a referendum. Should there be such a vote in 2017 and Maduro loses, his vice-president would take over - rather than there being a new presidential election - meaning the ruling "Chavismo" movement would stay in power.